Web hosting is the essential part of Domain, Onlive Infotech is the major Germany Dedicated Server Hosting plans provider Company in Web Hosting Server Industry. We provide cheap and best Server plans at very reasonable price for Germany (Berlin) location. Our Web Server plan is very eligible for every E-commerce website and web-based application to increase the business growth in Internet world. Get powerful performance on your website by our Germany based data centre facility. It will be help to increase the heavy traffic on your website. We are the absolutely best option for select the Germany Dedicated Server Plans for your business website. We have many types of web hosting Solutions available: The Dedicated Server is one of them. The dedicated Server plan price starting price at just $69/ per month. Get its most important features such as: Intel Core i7-2600 – 4C/8T/3.80GHz, 16GB RAM and 1TB HDD. Onliveinfotech company offers different-different specifications for CMS with proper installations such as: Geeklog, GetSimple CMS, Habari, ImpressCMS, Episerver CMS, ExpressionEngine, Hyland OnBase ECM, IBM Enterprise Content Management, OpenText Teamsite, Jadu, Jahia Enterprise Distribution, Kentico CMS, Drupal, Exponent CMS, eZ Publish, eZ Platform, ImpressPages, Jamroom, Joomla and many more. We also provide you best WHM Server Support for your Dedicated server plans with various kinds of Website Control Panel like that- ISPmanager, Kloxo, Kloxo-MR, MachPanel, MaestroPanel, OpenPanel, Plesk, ServerSuit, SysCP, Usermin, VestaCP, Virtualmin, Virtualmin Pro, Webmin, Zpanel and more. Get superior performance on your website via our best hosting plans. Onliveinfotech.com is providing you optimal solution for boom your website. Our affordable Web Server Hosting plans gives you optimally customizable option. 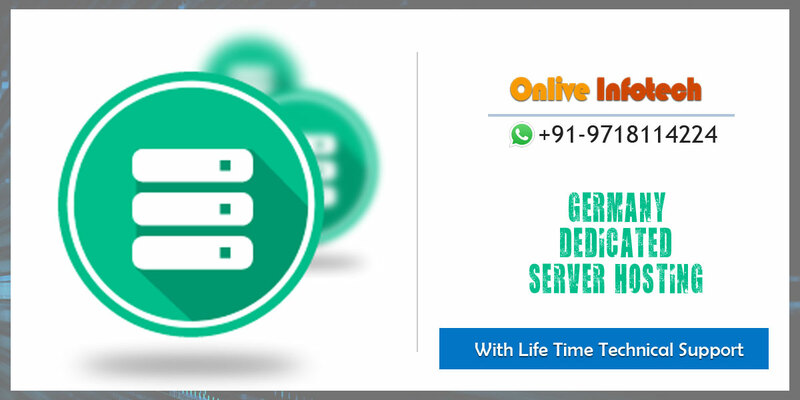 Onlive Infotech offers you the A-one hosting server plans that incorporates plenty of dedicated features and benefits, SSL & SSD Service, higher bandwidth, Germany based data center, HDD storage, fully reliable, great scalable, fastest network, Higher Connectivity, highly manageable, instant setup, Flexible Payment Plans, Protected by DDos Service, long time technical support service many more. Onlive Infotech’s professional supportive engineers are available for anytime, anywhere for solve your server issues and problems. You will get efficient technical support for your web hosting plans. Obtain right dedicated hosting services from our technical professionals so, you can connect them through Call on this Number: +91 9718114224, live chat on Website: onliveinfotech.com as well as Skype on this ID: ONLIVEINFOTECH anywhere and anytime. Onlive Infotech provides Web Server plans in 35 plus countries with each country wise data centres. If you want to buy Germany Dedicated Server Hosting plans then visit our official website take your best Order.